Before we were invited to sit down, the shop owner showed my new friend Kadir a şahmeran drawn on glass. In fact, the whole store, more or less a barrel-vaulted cave with a depressingly low ceiling, was teeming with images of this half-woman/half-snake mythological character. Kadir, a self-taught Kurdish master woodworker, nodded admiringly, and then announced that I had come for some fortune-telling. The shop owner responded: he did not know how to read fortunes. I replied politely: “I just want to hear some stories.” He asked for my first name and my mother’s first name, and he later wrote them out side-by-side in Arabic letters to figure out their numerical values according to the ancient abjad system. He was terrified by how low a score my name got, and by contrast, was amazed by how high the score of my mother’s was. “You have certain formations over your head,” he declared with a nervous expression, “do you want me to be honest?” I affirmed. Romain Kronenberg, Screening of ‘So long after sunset and so far from dawn,’ 2014. Sun Cinema, May 16, 2015. Courtesy of the artist. Mardin is a largely medieval town with sinuous streets between centuries-old buildings that are almost too ripe for potentially orientalizing narratives. The fact that mythologies have been embraced a curatorial framework (“with reference to [art historian] Ali Artun”) as late as the third edition of the Mardin Biennial may be a manifestation of the organizing committee’s anxiety about this aspect. However (over-)scrutinized myths and mythologies may be by region (no later than the advent of humanism, at least in the Western world) and in theory (following the publication of Roland Barthes’s Mythologies in 1957), their discussion in a rare (feebly) living site/sight of Asia Minor’s “melting-pot of civilizations” causes an anti-gravitational blossoming of forgotten/alternative realities. These ‘blossoms’ are not to be underestimated: they are a prelude to healing wounds that one might not even be aware existed. Mythologies, in the expanded field, are a vehement call to recognize the mechanisms by which we justify going about living our lives as we are and yet the works featured in the Mardin Biennial hardly go beyond this long-time consensual position on the same notion. Equipped with too many (albeit powerful) works inspired by local myths—boasting şahmerans or otherwise—the Biennial reveals an argumentative tone mainly through works that address myth(ologies) a little less directly. I therefore find myself drawn to artistic production that crystallizes around the subject of myth-making as a transformative force both for the individual and society. “How wonderful it is,” I remember telling myself as I was treading between different locations of the biennial not by taking the main thoroughfare 1. Cadde but its crooked and cramped neighbors, “that kids grow up running and screaming in different languages on these streets, and I have not left my country.” This (naïve) enthusiasm for multi-culturalism is partially a result of coming from a geography, where non-conforming identities of all types and their visibility have been under constant threat since the beginning of the 20th century. At the İskender Atamyan Mansion (better known as the old “German Headquarters” because of its deployment by the Germans in the First World War), I thus marvel at the photo-archive of the Mardin-born artist Sait Tunç, who is showing his collection of photographs from Mardin, spanning some fifty years roughly from the beginning of the 20th century. They appear to be arranged by typology—photographs of religious and secular holidays, of wedding and circumcision ceremonies, and family photographs count among the “genres”—in neat vertical rows. Each photograph is of the same size, as they are mere digital reproductions of the originals that Tunç owns. With a half-hearted smile, he points at one of the women in the photographs and points out that the “room” we are in, which no longer has windows nor an even, clean floor, belonged to her. Sait Tunç, photo-archive, installation at Atamyan Mansion. Photo by Özge Ersoy. The more one looks at Tunç’s photo-archive, the many more waves of a sense of loss wash over the viewer: next to a photograph of a turn-of-the-century Syrian Orthodox family with deep, exquisite shadows, one might find a photo from around 1943—the year of the 20th anniversary celebrations of the founding of the Republic—wherein girls in bride-like gowns stand in front of men in military uniform, supporting a tautological banner that reads “We resemble our own kind.” The whole city permeates the vacancy of those that did not resemble—not only in Mardin, but also in Kobâne that has been ravaged by ISIS last year. The originals of the photographs remain out-of-reach with the enigmatic circumstances around their acquisition undisclosed. In one of the rooms, a rectangular stone block inscribed with the Armenian alphabet and dated 1874 lies dormant on a humbly elevated niche: the slight displacement of what might have decorated the entrance of the Mansion with naively sculpted flowers channels an uncanniness similar to the slight re-formatting of the found photographs which must not have strayed too far away from the places seen in them. This sense of loss is similar to the one evoked by another work shown at the Atamyan Mansion: Mardin-based Evrim Kavcar’s Beware of the pit (2015) takes its title (and content) from a sign that the artist saw in front of a very large rock with a threatening crack. Sensitizing herself to the ontological dimension and linguistic use of a ‘void,’ she asks the following questions in the hand-written book-object that accompanies the installation: “What meaning does the void not entail? Where is it? If it had a place, where would it be?” These existentialist probings take on an unexpected turn, when Kavcar has the phrase manufactured in iron at a local ironsmith, and puts this wobbly cursive “writing” over the rift between Upper Mardin and Yenişehir (New Town). Evrim Kavcar, Beware of the pit, 2015. Courtesy of the artist. The book-object reveals that, when the opening of the 3rd Mardin Biennial was delayed several months due to the ISIS bloodshed in Kobâne, the artist removed the first and last words of the sentence, leaving only the word “void” ominously suspended over the Mardin skies. What begins as an Ed Ruscha-like pictorialization of a found-sentence, some tongue-in-cheek dalliance with semiotics, turns into a performance of absence (for the act of e-vacuation is already performed) that corresponds to the appalling absence of respect for human lives on the other side of the border. Kavcar’s book-object further experiments with the production and amplification of “voids” and loss in different media—be it a pinned needlework flower by one Aysel Hanım, labeled “the floral state of a void,” or a drawn-in photograph of German-looking officers standing in front of one of the Atamyan Mansion doors on transparent paper over a zoomed-in on, present-day photograph of the same passageway. The latter’s resistance against ekphrasis is equally present for the genocidal events of 1915 that led to the state expropriation of the Mansion. 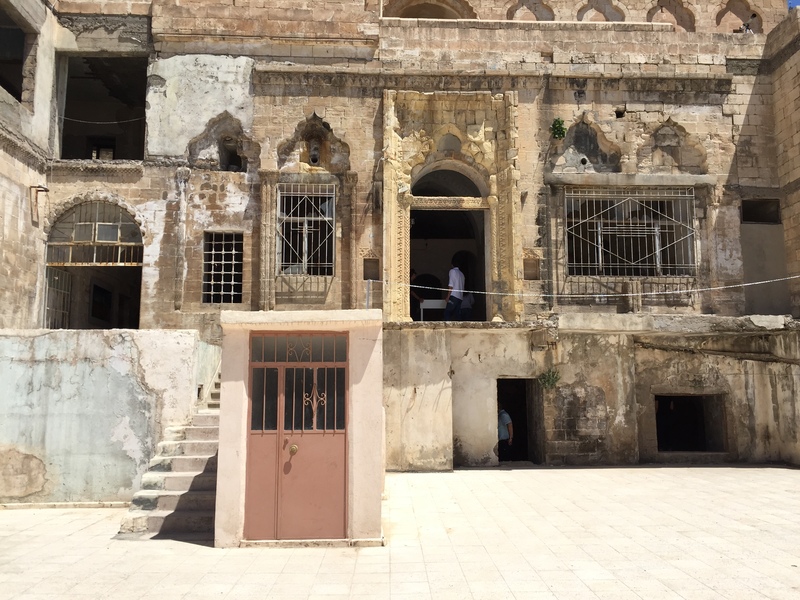 The two main venues of the Mardin Biennial, the Atamyan Mansion and the Mor Efrem Monastery, are far from being white cube spaces to the extent that you might happen upon a (non-art) dead bird in its nooks and crannies. Works of art “occupy” the exhibition spaces in a non-invasive way like cautious distant relatives arriving at a wedding, if they are not crudely amplified by the dramatic stage that the architecture of a run-down stone building is. The unimposing mise-en-place can perhaps be attributed to the Biennial’s decision to adopt a collective curatorial model, delegating responsibility to “a team of volunteers rather than . . . a certain curator or group of curators.” Döne Otyam, a member of the curatorial committee, writes that “[they] attempt[ed] to present an imaginative ‘experiential field’, where it is possible for different dreamscapes to meet, just like at a ‘feast’.” Yet, in the rough and raw spaces of the Biennial, there is very little of the carnivalesque that one might expect to see at a ‘feast.’ Instead, there are calculated curatorial gestures, unlike the majority of other works, dispersed around the town in a rather carnivalesque way. These light-heartedly “out-of-proportion”, consciously ostentatious interventions tightly (cor)respond both to their environments and the expressed curatorial vision, should the “dream” in “dreamscape” be a euphemism for ‘thinking boldly’ or vice versa. Atamyan Mansion / German Headquarters, May 2015. Photo by Özge Ersoy. Among these gestures is a gigantic white egg by the Ankara-based artist collective Yaygara—titled Broody (2014)—, sitting in the courtyard of the Chaldean Church on the main avenue, which is hard to miss because of its size. Broody, with its enigmatic bulkiness and deliberate positioning in relation to the public eye, playfully embodies a quality that may be described as ripeness for myth-making without relegating myths to inane credulity. By planting a possibility of (re)birth in front of a church with a dissipated congregation, Yaygara examines the performative dimension of myths, coming from the Ancient Greek root of the word mûthos, which simply means “something said.” Once a proposition is uttered, released to the wider world, world-making begins (or rather actively continues) whether or not you “buy into” it. Fırat Engin, They can pick all the flowers but they will still not be able to prevent the arrival of Spring, installation view at Atamyan Mansion. Photo by Gökcan Demirkazık. Myths and mythologies are thereby elegantly delineated as mechanisms of meaning production and its potentially felicitious (in the J.L. Austinian sense) propagation. Diyarbakır-based artist Deniz Aktaş’s untitled photo-installation, also at the Atamyan Mansion, takes the issue of “circulation” to the heart of the matter. On a faded grey-blue wall, one encounters a somewhat awkwardly spaced array of magnified single headshots (vesikalık) and framed white pages with multiple rows of headshots glued on them. These photographs of predominantly Kurdish village women were collected by the artist’s father during his tenure at different state departments (such as the Diyarbakır Census or the Ministry of Finance), where a constant stream of square-ish, frontal headshots flows in, only to be discarded in heaps if they cannot find a place to insert themselves on official documents. Calling A4-sized pages on which these small photographs accumulate “a family album,” Aktaş explains that they came about as a result of the collective undertaking of six people (Aktaş, his parents, and his three siblings) since he was little, and that there are at least 80 of them today. 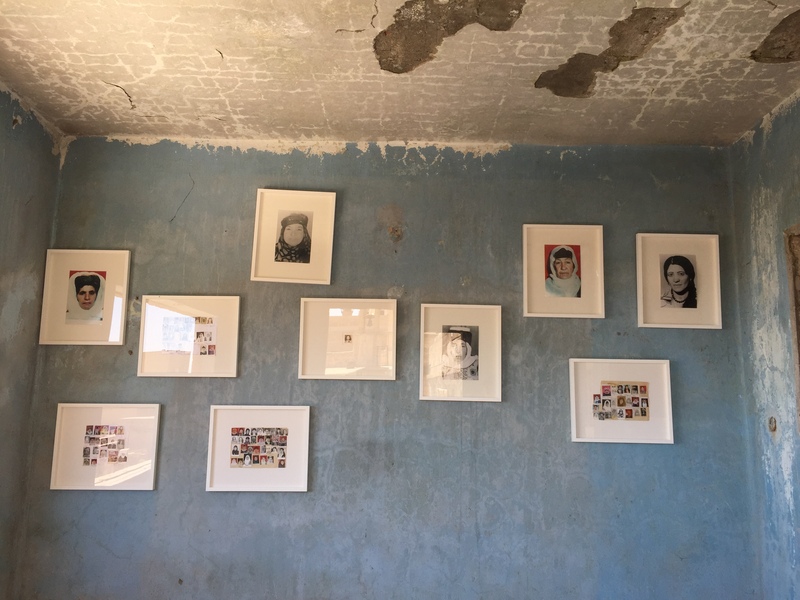 By contrast, the magnified headshots, the artist reveals, are photographs that his father attempted to exhibit as such at the Diyarbakır headquarters of the Human Rights Association (İHD) in 1997, but the whole show was brought down by the police shortly after the opening. He admits that his only intervention in this instance of their installation was to frame the photographs: he did not have the heart even to hammer another nail on the wall, and used the existing ones—hence, the “clumsy” hanging. Deniz Aktaş, found photos, dimensions variable. Installation view at Atamyan Mansion. Photo by Özge Ersoy. This serendipity follows the lack of an overall organizing logic behind these photocompositions on paper. The singling out and magnification of specific headshots symbolically urge the state to acknowledge those Kurdish women and men as citizens and individuals—a request that was all-too-terrifying for 1990s’ Turkey. While the Aktaş family’s anonymized mode of production minimizes the palpability of time, father Aktaş’s censored headshots put a specific moment in time back into circulation, the resulting temporal relief being the oxymoronic “architecture” where myths dwell. I listened to the şahmeran master explain the side-effects of having a djinn (“cin” in Turkish) around—sleeplessness at night, the trouble with women, and the rest… Under his breath, he said that he had got a headache the moment I had entered the store, twice. I smiled as I left the store: for these stories had to be told for time to pass. I tried to imagine how many times this shop owner must have told the same things to other people… and how many more times with the tiniest of modifications in words, tone, and facial expression based on an immaculately executed internal assessment of the listener. Just as they had survived centuries, maybe millennia, to shape people’s lives in radical ways, I wondered if it was still possible for emerging myths to achieve the same longevity for the better or for the worse. The 3rd Mardin Biennial, in retrospect, was an inquiry into this precise question. Yet I could only wish it were not an International Art Exhibition with all its connotations of refinement and self-propelled exile to the narrowly defined sphere of art. A more solid “possession” by some djinn like mine could have done wonders to the Biennial by haunting it away from being just demonstrative of the fascinating lives of myths, and letting people understand (if not experience) their course in little but engaging ways I cannot even imagine. Mor Efrem Monastery, May 2015. Photo by Özge Ersoy. Gökcan Demirkazık (b. 1992, Ankara) is a writer and researcher based in İstanbul. He received his BA in History of Art and Architecture from Harvard College with an emphasis on eighteenth-century French visual culture and the historical avant-gardes. His senior thesis, titled “Sarkis in the Trenches: Towards an Art of Memory, 1969-1986,” situates the mnemonic turn in the artist’s oeuvre within a pattern of denying viewers phenomenological data. Demirkazık has previously worked as a curatorial intern at the Whitney Museum of American Art, the Museum of Modern Art, and SALT. Virginia Woolf, above all, poignantly articulates how one’s absence can acquire not only a tangible, but also a dynamic dimension through her/his “remnants”: “What people had shed and left—a pair of shoes, a shooting cap, some faded skirts, and coats in wardrobes—those alone kept the human shape and in the emptiness indicated how once they were filled and animated; how once hands were busy with hooks and buttons; how once the looking-glass had held a face; had held a world hollowed out in which a figure turned, a hand flashed, the door opened, and in came children rushing and tumbling; and went out again.” Virginia Woolf, To The Lighthouse (London: Penguin, 2000), 141 (my emphasis). Claudia Segura Campins, Döne Otyam, Ferhat Özgür, Fırat Arapoğlu, “Bir şölen çağrısı,” Istanbul Art News 13 (October, 2014), “Mardin Bienali” supplement, 1. Döne Otyam, “Düşsel bir deneyim alanı,” Istanbul Art News 13 (October, 2014), “Mardin Bienali” supplement, 3. In the same vein, the dozers that level hills are likened to Zeus who vanquishes the Titans. Posted in on artists and tagged 3rd Mardin Biennial, Özge Ersoy, Deniz Aktaş, Evrim Kavcar, Fırat Engin, Gökcan Demirkazık, Mardin Biennial, Romain Kronenberg, Sait Tunç. Bookmark the permalink.